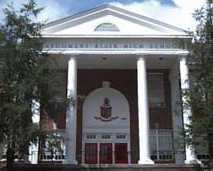 Montgomery Blair High School was constructed in 1935 to replace Takoma-Silver Spring High School, which was too small for Silver Spring's growing population. The new school was named for Montgomery Blair, who was Abraham Lincoln's Postmaster and also Dred Scott's lawyer before the Supreme Court. After World War II, when Silver Spring's population boomed, Blair High School's enrollment also grew. The school's campus expanded several times, but eventually a new Montgomery Blair High School was built and it opened for the 1998-99 school year. In 1963 Montgomery Blair was honored on a postage stamp commemorating the 100th anniversary of the first International Postage Conference. The first day of issue ceremony was held at Blair High School. From the Silver Spring Post Office Centennial commemorative envelope.